These thickly cut Crisps featured a unique space between Ridges within which you could fit your teeth. This allowed for a crispy snappy Crunch. The result of a sustained munch was a mulchy pulp rather than a smashy mash. The first thing that should be mentioned is there were very few Crisps in the bag. This was because most were whole and most were very large. It is rare we are greeted by such perfection in a bag. The large Crisps were thickly cut with deep Ridges. As the flavour variety was Plain/Regular etc., there was not much seasoning about. At first I thought there was not much Salt on these thickly cut Crisps, but on closer inspection I was reminded that the flavour was in fact 'Lightly' Salted. And this is where Mackie's cracked it. 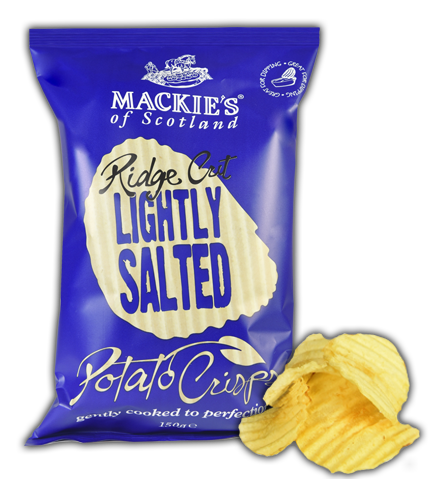 Thickly cut Crisps often suffer from a lack of seasoning because the additional thickness soaks up a lot of the flavour into the potato. These were perfectly balanced. An ideal lunch partner for one of those oh so disappointing supermarket sandwiches which upon opening appears to be missing half its alleged contents.